Philadelphia Art Alliance was also a perfect venue for D'Artaganan, gourmet food purveyor of organic, antibiotic-free meat, poultry, game and truffles, to hold a 5-course dinner featuring an assortment of decadent dishes highlighting D’Artagnan duck, lamb, foie gras, Mangalica ham, caviar, cuck bacon, chorizo, quail eggs, truffles and squab; all in celebration of the company's 30th Anniversary! The event was hosted by Ariane Daguin,CEO and co-founder of D’Artagnan. Daguin is also, along with many other accomplishments in the culinary world, an Awards Committee Member of the James Beard Foundation’s “Who’s Who of Food and Beverage in America”. Ariane has been at the forefront of the organic and sustainable movement in America, pioneering organic, free-range meats (years before the USDA allowed the word “organic” on the label), preservative free foods, and humanely-raised livestock for over 25 years. Ariane and D’Artagnan have since become renowned for putting the finest foie gras, meat, game, truffles, and mushrooms on the tables of American gastronomes, whether at home or in 4-star restaurants. Our system's Publishing Tool allows you to create a PDF version of your whole cookbook to use as an ebook to sell, download or put on a Kindle or Nook. Below is a video from the evening of Ariane deboning a duck to get to the liver which foie gras is made from. You'll also learn the humorous reason of why foie gras is so expensive. You know I wish I had been on the invite list to have experienced the 5 course celeabratory feast, the guest list included a number of Philadelphia’s top culinary stars - Chef Konstantinos Pitsillides of Kanella, Chef Lee Styer of Fond Restaurant and Chef Greg Vernick of Vernick Food & Drink, each of whom also created a dish for the event. 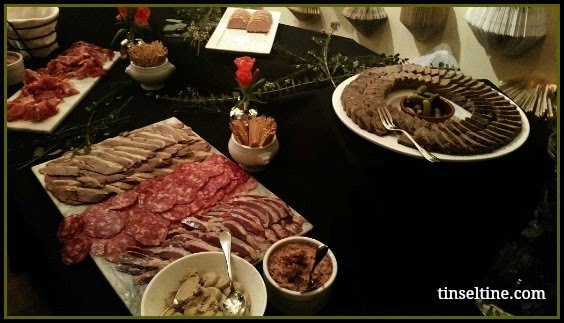 I was fortunate enough to be invited to the after party - "Party til the Quack of Dawn", where I did sample some extremely rich and flavorful foie gras mousses and pates, cured hard salami and other assorted charcuterie meats served with Chateau d' Oupia Minerviois 2012. I also loved feeling quite decadent leaving home at 10pm to attend an event, but then again I guess you could said, I left my house, to go "home".